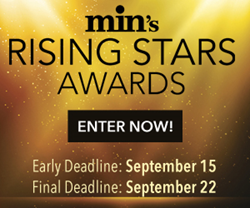 The early deadline to enter the program is Friday, September 15 with a final entry deadline of Friday, September 22.
min’s Rising Stars Awards acknowledges exceptional young professionals across the magazine media industry—editors, marketers, sales execs, designers, brand strategists, and more. The prestigious honor has helped dozens of young professionals accelerate promising careers in magazine media. This year’s honorees will be celebrated by the min community and profiled on minonline.com. The early deadline to enter the competition is Friday, September 15 with a final deadline of Friday, September 22. For questions on the program or entry process, please contact Zoe Silverman at zsilverman(at)accessintel(dot)com or 301-354-1662. As magazine media evolves at a breakneck pace, min continues to be a trusted, one-stop resource for the mass-consumer magazine media industry. For more than 70 years, min has been serving its community with unparalleled content, events and awards programs that spotlight successes and innovations within the community and the wonderful teams behind them. For more information, visit http://www.minonline.com.